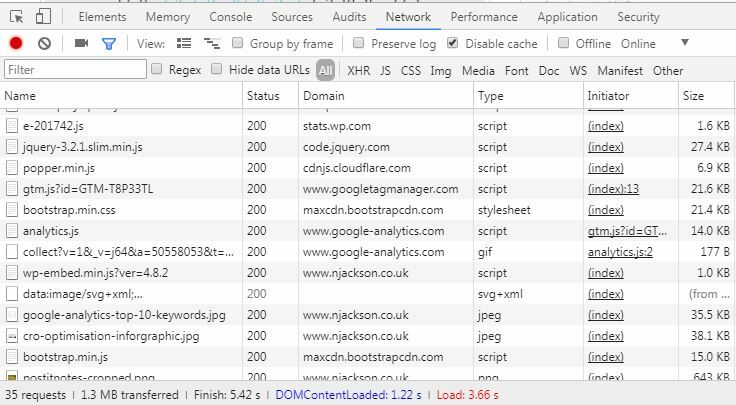 Your browser’s native developer tools are a great way to test third-party tags (Google Analytics, Display/Social Pixels) if you’re unable to (or don’t want to) add extensions such as Google Tag Assistant or Ghostery to your browser. If you have tags that you want to debug through these tools, follow the below steps. Some tags may not respond with a 200 (Ok) HTTP status code, but as long as it’s not a 404 (Or another 4xx code) your probably fine. If in doubt, check with the tag’s provider. If you aren’t the person who added the tags, or you’re not sure which path or domain to look for, there are a few places you should check. If you can’t see any signs of your tags, they may not be deployed yet! Feel free to leave a comment or a question below!